Conspiracy theorists, this is your week. Last night, everyone’s favourite nicotine-driven villain, William B. Davis, better known as The X-Files “Smoking Man,” launched his memoir, Where There’s Smoke . . . Musings of a Cigarette Smoking Man (ECW Press), at Toronto’s Gladstone Hotel. This morning, well, there was a press event of a different kind at the Women’s Bookstore. Judyth Vary Baker isn’t a household name. She’s been in hiding since her former lover, Lee Harvey Oswald, was accused of assassinating president John F. Kennedy in 1963. 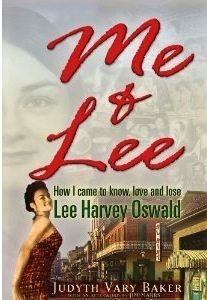 Baker’s 600-page memoir, Me & Lee: How I Came to Know, Love and Lose Lee Harvey Oswald (TrineDay), postulates that Oswald was set up and then murdered before he could be convicted. Baker told the Toronto Star she met Oswald while the two were working in a New Orleans coffee shop, a cover while they were both involved in a plot to kill Fidel Castro with cancer. Since she has spoken out about her past, Baker says her dog has been shot, her car’s brake lines cut, and she’s been followed through two states. Baker has emerged from the safety of her overseas home in hopes of clearing Oswald’s name. If that’s not enough intrigue, the press release for the book states that Me & Lee is one of former Minnesota governor/wrestler Jesse Ventura’s top-six favourite conspiracy reads. You can meet Baker and pick up a copy of the book at the Conspiracy Culture Shop in Toronto, which is hosting a 72nd birthday party for Oswald, tonight at 7 p.m.